High-fructose corn syrup, an extremely cheap, processed, and easily produced alternative to sugar, has been deemed ‘safe’ by the Food and Drug Administration since 1976. For decades, corn has been converted into high-fructose corn syrup for companies to use in their products at an extremely low cost, but it wasn’t so long ago that the dangers of this sugar alternative and food preservative have been recognized. Below you can view an infographic outlining the many dangers of high-fructose corn syrup, and how the production of corn syrup in general has made America FAT. Not many individuals would be surprised to hear that corn is the most widely planted cereal crop, with nearly 163 million hectares of land area being used for cultivation. Think the state of New York doubled in size for dedication to corn. And what do these corn fields output? 316 million metric tons were produced between 2011 and 2012 – nearly 6x that of wheat and 20x that of cotton. Frighteningly, much of this corn isn’t even made to eat, as it actually isn’t edible. The commodity is often produced with government backing for one primary reason – to be processed. The corn is simply a raw material meant to be transformed into the harmful ingredients we’ve come to consume so often today. It requires 3.2 pounds of corn to create 1 pound of high-fructose corns syrup. So it isn’t surprising that 25 million metric tons, about 8.2%, of corn was turned into HFCS between 2011-12, yielding 8 million metric tons of HFCS. As mentioned, 8.2% of corn was transformed into high-fructose corn syrup between 2011-2012, yielding 8 million metric tons of HFCS. While the food preservative is great for companies and manufacturers, consumers are suffering from the widespread consumption of the sugar alternative, Often containing mercury, HFCS has been shown to cause liver and kidney damage, decrease insulin resistance, increase blood pressure, decrease amount of blood and oxygen transferred to muscles, sabotage learning abilities, and make people fat. Lastly, corn is almost always genetically modified, causing concern for both human health and negative impact on the environment. More than 85% of American corn crops were genetically modified in 2009, but that number has likely increased since that time. How exactly is the genetic modification of corn causing harm? GMO foods have been shown to cause harm to animal and human health in numerous ways, with Monsanto’s Bt corn causing weight gain and organic disruption, as a single example. GM corn requires more pesticides and herbicide use, especially that of Monsanto’s best selling herbicide Roundup. Pesticides and herbicides create resistant crops (calling for even more use,) have been tied to birth defects, and could be making you fat, among other things. 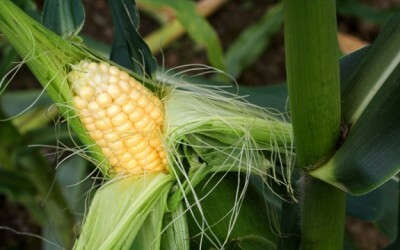 Insecticides modified in GM corn pollute U.S. waters. Corn requires more nitrogen fertilizer than any other crop, which creates dead zones – areas in water where virtually nothing can live due to lack of oxygen. Check out the latest created infographic below. Nice article but it should be written better. Some of the sentences don't even make any sense. is it HFCS or HFSC? Please proofread and resubmit, then I can share it with others. One of the key problems with corn syrup is that,calorie for calorie it does not provide the same level or type of sweetness that sucrose [cane sugar] does. Just 50 calories of sugar will equal about 150 calories of corn syrup in sweetness. If you combine this with the difference in how it is metabolized this leads to a higher rate of intake which, over years adds 10 – 15% to overall weight normally gained as one ages. Over a two decade period this produces a dramatic increase in fat our population carries around. My wife and I have been eating mostly home make breads and drink soft drinks only rarely for the past four years. The result has been dramatic. Without trying I have slowly lost almost 25 lbs. Yes; sugar costs more. However, it is a higher quality carbohydrate.